With greetings, we, the the workers of South Pars Oil and Gas fields and the refineries of Bandar Abbas and Bushehr, the under signatories of this letter, invite the news group of your network to send a team of reporters to the area to cover and investigate the problems and issues confronted by the workers of the South Pars projects so that our concerns and pleas can be conveyed to the responsible authorities and for our demands to be addressed. Enclosed with this letter, please find the list of names of 1000 project workers who have signed and added their National Identity Numbers. 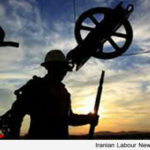 Should you agree to assist us – the defenceless and forgotten workers – please coordinate with our workers’ representatives, Mr Maziar Gilaninejad and Mr Arsalan Amini, to agree and coordinate the exact date and location in order for your news group to prepare a report and interview with the workers in the place that you determine. We would like you to make the necessary coordinationand further instructions. <<This letter was delivered to both the office of IRIB News Network and to the office of Mr. Seyyed Mehdi, the Head of IRIB, on 6 November 2017.